Have you noticed lately there are lots of ads for mattresses? Some have foam tops with “memory”. Some have your personal number. The sizes range from baby cot mattresses to the huge California King size. I would have thought Texas should have claimed that honor. The history of bedding is an interesting look at the evolution of modern home furnishings. 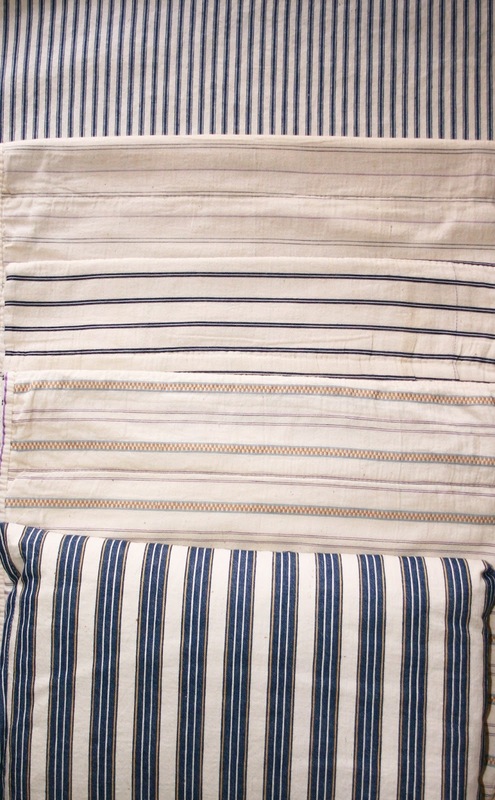 One of the enduring textiles associated with bedding is ticking, the familiar blue and white stripped covering for pillows and feather bed ticks, therefore the name. 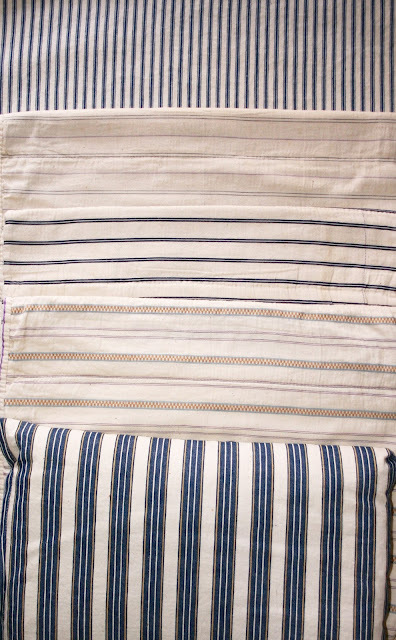 Originally made from linen, and then cotton, ticking was woven in a herringbone pattern that kept the feathers in place, but often several of the common weave would be used. The featherbed, really an elongated pillow, filled with feathers or down and covered with ticking could be found until the beginning of the 20th C, despite the introduction of cotton-filled mattresses. Of course, we have returned now to what is considered luxury bedding with down and feather comforters and duvets. 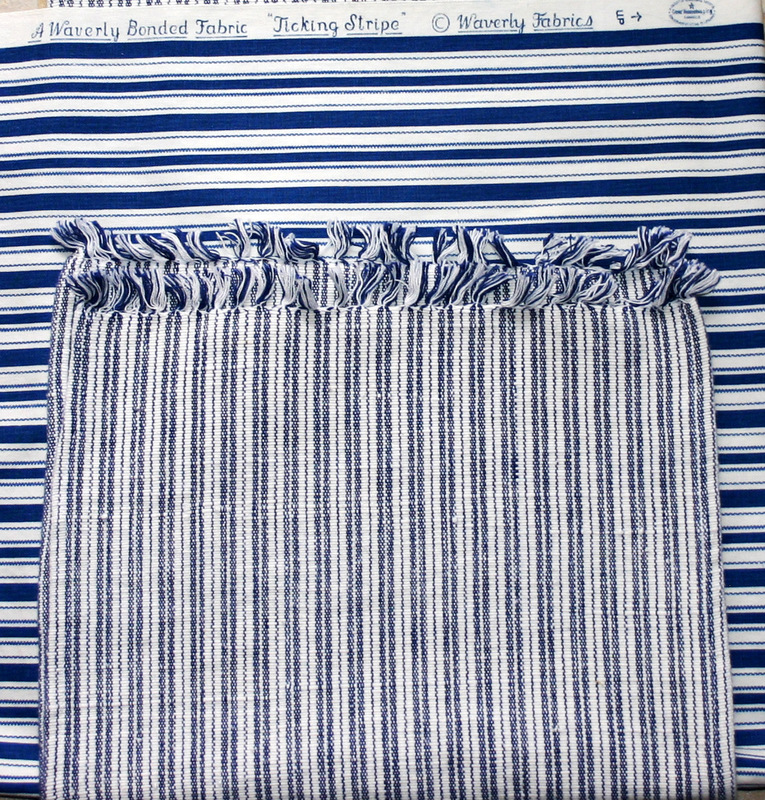 While the usual pattern was blue and white stripped, there are many examples of this fabric in browns and even Jacquard weaves. Today ticking is made as furnishing fabric in many colorways and frequently used by decorators for its crisp appearance. 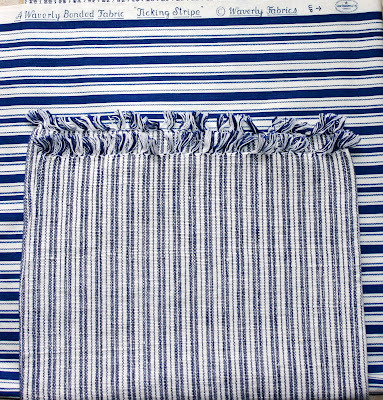 "A Waverly Bonded Fabric ", "Ticking Stripe"
"100% cotton Handloom- made in India. Imported by Primitive Artisanins"